The life and times of . . . well me. : Be a Man! So I found this new blog that I pretty sweet. 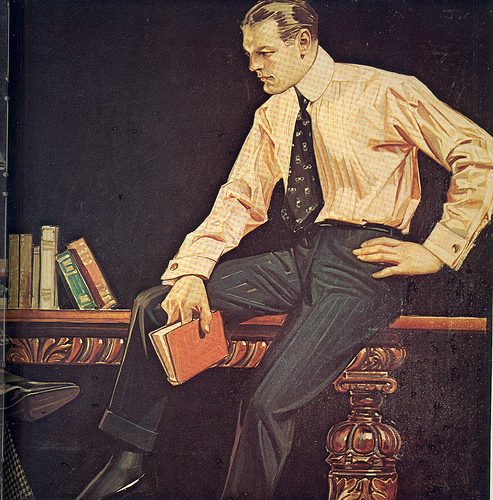 It is called the Art of Manliness - and if you are of that gender you should go and check it out. Topics that I have seen so far range from how to be a good father to how to dress well or to speak well or to give flowers with deep meaning. The blog is written by a man and his wife, so you are getting what men like and what (at least one) women like in a man. I think that we need more of this. God created men and women to be different - we need to celebrate those differences. A true man will support, respect, and empower women; but he will do it through his masculinity and empower her to use her femininity. When the bible says that God created humanity in his image it immediately says that he created male and female - both male and female together make up the image of God. So be a man (if you are one), and reflect God's image (or at least half of it); if you are a woman then you can reflect the other half of God's image. Together we can show the world the face of God! So God is half man and half woman? Thanks for the tip, I need some manliness. According to this site you should be doing pull ups instead of push ups. Looks good and reminds me of the Chariots of Fire "Muscular Christianity" emphasis. However Tim is right. We will probably have more need to do pull ups than push ups. But I can do like 20 push ups, but only one pull up. Push ups are way easyer.